When the ancient man first started needing shelter from the elements they sought out caves and caverns so they were able to remain dry and safe. The first known upright human was found in a cave in South Africa. As they developed, over the eons, they learned to develop shelters for themselves. In Africa, the source of early man, These shelters tended to be fairly rudimentary and temporary, made from mud bricks and thatched grass. Consequently little remains to show. But man was on the move. Spreading northwards, eastwards and westwards the primitive man found himself needing more robust structures as the temperatures got colder in winter and the weather got fiercer. So he started buildings of sorts with stones and later learned and developed bricks and mortar so that early civilizations in Egypt, Greece and Rome as well as elsewhere still have structures standing that were erected in those times. But with all of these structure the biggest problem was waterproofing the roof. Grass huts were only waterproof if they had sufficient slope to ensure that the precipitation ran off rather that penetrating. 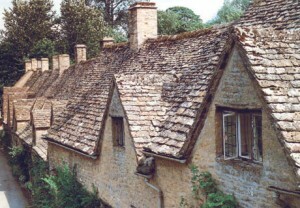 But Thatching is heavy and needs frequent renewal. A more permanent solution was found in the use of slate and later clay and Terracotta Tiles. Slate was and is heavy and expensive to transport whereas clay is found everywhere and setting up moulds and kilns was a fairly straight forward procedure . The Romans developed the means of making tiles waterproof by the development of lips and curved roof caps which is essentially the type of roofing tile that is in use to this day. Later after the industrial age developed the process of rolling out steel plates corrugated Iron became a cheap and effective means of roofing. These have pervaded everywhere and can be found in the darkest corners of Africa and the most prosperous cities in the first world. Whatever style of roofing is being used all roofs have the same function: To keep the weather out. If for any reason the water or weather proofing of a roof is compromised then it is essential to get it repaired as quickly as possible, before rain storms let in water to damage the interior and furnishings. There are any numbers of ways that a roof can cease to be weather proof, The most common are things like storm and wind and hail damage. Extreme weather such as is occurring in January 2014 in the US can result in many unexpected problems for the security of people’s homes. For example a in most countries where there is a large snowfall the roofs are generally built with a steep slope to ensure that snow doesn’t accumulate. A heavy snow fall can easily add tons of extra load on a system not designed as load bearing. The same with wind which can overload the designed stress level and hail can break tiles or slate and cause a leak. Age and rust will eventually compromise the integrity of corrugated iron or tin sheeting. Whatever the cause one wants to get any break mended as soon as possible and Shelton Roofing is your local expert with over 70 years experience in Southern California.